A few general horse riding tips to help you improve your riding and ways to save money with good stuff like homemade horse treats and homemade fly spray that will improve your horse care. As the show season starts you may want to take your own water supply with you in your horsebox or trailer but you don’t have a suitable container. Just place a clean new black rubbish bag inside a bucket and fill it with fresh water. Then tie a knot in the top to make sure the water doesn’t spill everywhere during your journey. There’s nothing better than the fly spray on the main equestrian tips page. I’ve used the garlic and olive oil fly repellant for years and it not only saves me money but is the most effective fly treatment I’ve ever used. It’s time for clipping – so I always make sure that I bath my horse using the natural fly repellant tip. The vinegar bath really conditions the coat and removes the excess grease, allowing the clippers to cut better and giving a far better finish. A harsh winter can really take it out of your skin and really dry your hands. Try using Hemp hand cream from the Body Shop, it helps protect your hands, is dermatologically tested, relieves very dry skin and restores moisture and suppleness. It isn’t cheap but I find it does work. 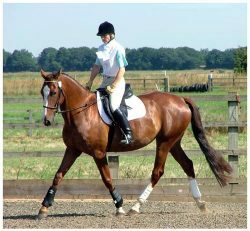 On circles, don’t ride too much with your inside hand, ride with it half-way up the horse’s neck … this will show if you’re using too much inside rein. Have someone video you when you’re riding so you can watch yourself later. Make mental notes and correct any problems with your position. When trying to collect your horse, imagine he or she is a spring that you have to coil up and store energy in. While riding smoothly lift your shoulders then push them back and round. Lift up, roll back and relax. This will improve your posture and relax your hands. Tie two reins, ropes or two pieces of baling twine to a fence. Hold them as if they’re your reins. Take up a firm contact of at least 10 pounds in each hand. Then, adjust the weight of the reins by softening your arms, forearms in particular. Adjust your pressure or feel from 10 pounds to 5 pounds then back to 10 pounds and then down to 2 pounds. Teach yourself this feeling of adjusting the weight of the reins and you can then transfer the same technique to your riding as you feel yourself getting too strong. Pretend your favourite drink is in the middle of your hands and you don’t want to spill it. This will help keep your hands in the right place. If you tend to lean inward during circle work, pretend your outside buttock is filled with lead. This mental imagery should help you straighten up. If your horse’s neck isn’t there you’ll be the first to know. Think of your body growing upwards and your legs growing downwards. 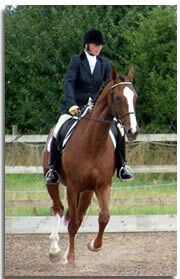 When doing sitting trot, think of alternating your heels stretching down…left, right, left, right. Singing the original ‘Oompa Loompa’ song (from the first Willy Wonka movie) really helps keep your rhythm at the sitting trot! It will help maintain proper posture. When you’re cantering, pretend you’re sitting on a £50 note and you don’t want it to blow away. Think of your reins as cotton that will break if you pull too hard. When going over a jump, focus on a high point in front of you, like the top of a tree in the distance, so you don’t look down. If you ever feel like your horse is about to bolt or you are losing your balance, just sit back and move your feet forward putting some weight on your stirrups, just like the rodeo riders do. Try it … you’ll find you feel a lot more secure. Pretend there is a piece of string attached to your helmet to keep your back straight, and sand bags attached to your heels so they stay down. "If I was in this same position on the ground, could I stay standing?" You need to perch between the ‘wind and the water’ (so to speak!) Imagine a line that goes from your shoulders, to your elbows, to your hips, then to your heel. Pretend the reins are two ice cream cones that you must hold carefully, so they don’t crush. At the rising trot, imagine there is an egg on the saddle and you must sit down gently so you don’t break it. Spread your toes, it will help keep your heels down. Don’t think of the horse as a rocking chair! When you’re riding, don’t sit like you do in a chair, with your legs out in front and knees bent. Sit in such a way that if the horse wasn’t there, you’d still be able to support your own weight when standing. Before doing a sitting trot, take your feet out of the stirrups, pull up one leg and tuck it up for 10 seconds and let it down again. Do this a few times and then switch to the other leg. This helps loosen and relax your hips. Never try and sit still in the saddle…that’s a moving horse beneath you and you have to move with it! Try to make your seat move with whatever your horse’s back is doing. Try this little exercise … shoulders UP, BACK, ROUND and DOWN then repeat. off the floor. This makes it much harder for your horse to use them as cribbing edges. Cribbers often do better outside where there is more to keep them busy. Cribbing is almost impossible to cure, however good management will reduce its frequency. Are cobwebs driving you crazy? Knock them all down and then wash the walls with a Lysol solution. The mixture doesn’t have to be very strong but will discourage spiders and repel flys. One wash down should last you all summer. What should should you buy accutane online I avoid while taking Diclofenac..